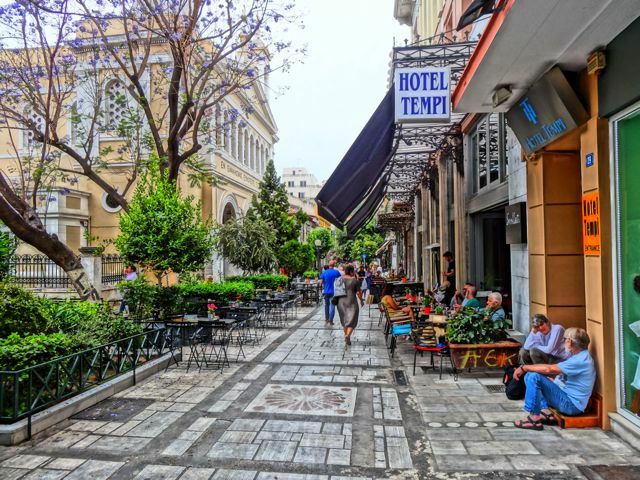 The life of a tourist visiting Athens is a nearly carefree one. What is there to worry about really? Will there be enough time to squeeze in all the archaeological sites and museums? Will I have time to go back to that wonderful restaurant I ate at the first night? Will the taxi to Pireaus to catch the ferry show up on time? Will cousin Billy like the idiotic T-shirt I bought him in Monastiraki? Did I leave a big enough tip? I mean, you spend more time worrying about Athens while planning the trip and on the airplane, than you do once you get here. Sure there are those periods where stuff happens, demonstrations, the occasional riot, forest fires, earthquake, general strikes, the kind of stuff that happens in Paris that tourists don't even know about, and you see it on the news and suddenly your trip to Greece looks like it may be the last thing you ever do. But the reality is that once you get to Athens you end up asking yourself what the problem was. 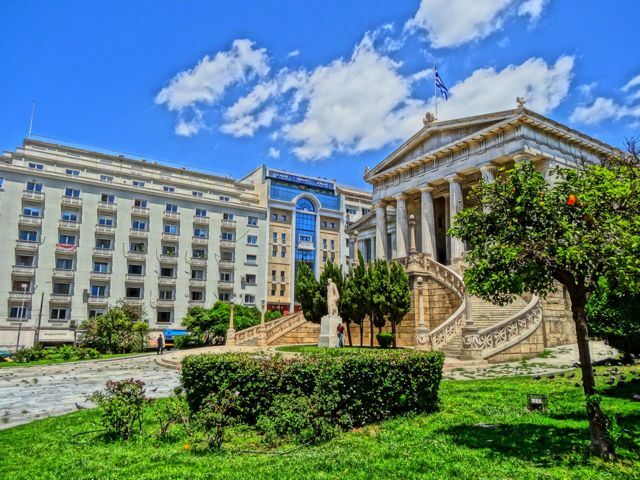 You do your two or three days there and go off to the islands for a week or more if you are lucky, spend that last day and night in Athens shopping and a last meal and you get in your taxi in the morning and fly away vowing that you will return. When you get back to your friends they act like you have just returned from Afganistan. Weren't you afraid? Did you see any riots? Did you get tear-gassed? But since you were not watching the news during your holiday you don't even know what they are referring to. Sure you saw a crowd of people marching up Panepistimiou but it had nothing to do with you so you just used another street to get to where you were going. Sometimes I wish I were a tourist. When I told my friend George that I wanted to move to Athens he did not think it was a very good idea. "Greece is a very difficult place", he told me. "There are many hardships. The government is made of criminals who want nothing but money and the people try to keep their money so there is war between them. Doing business here is impossible. Because the government is criminal they force the people to become criminals too. Life is so difficult here for working people and so they go on strike and that makes life difficult for the other working people. Metro strike, garbage strike, trolley strike, demonstrations that close the streets, government workers who do nothing but take a paycheck who can't even give you correct information when you go to their offices. Terrible traffic, pollution, bad drivers, loud motorcycles. Police who do nothing to stop criminals. Tax collectors who come to your business and threaten and extort you, and other business people who believe it is their right to take everything you have by any means necessary. Why would you spoil the beautiful relationship you have with Greece by living here and seeing the reality?" "Yes but what if I didn't come here to do business? What if I just came and did what I do when I visit? 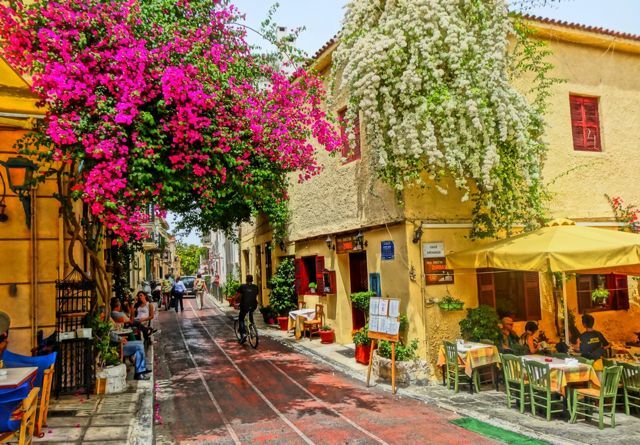 Explore the countryside, go to different restaurants, visit the islands, and write about it every day for my website and had nothing to do with the Greek bureaucracy." "Ahhhhh. In that case Greece is a paradise." George is right. As long as you are living apart from this society you can walk between the raindrops. If there is a metro strike I can take a trolley but really is there a reason I have to go downtown today instead of tomorrow? My company is in the USA and I pay my taxes there so I don't have to deal with the bureauracracy except to pay my DSL bill. If there is a demonstration at the University or the Polytechnic then I don't go there. Anyway when there are demonstrations the buses that go through those areas stop running so you really have to go out of your way to find yourself caught up in a demonstration. Even when there are confrontations between demonstrators and the police it is like a spectator sport with people watching on the sidelines until they get bored and go on with their daily activities. 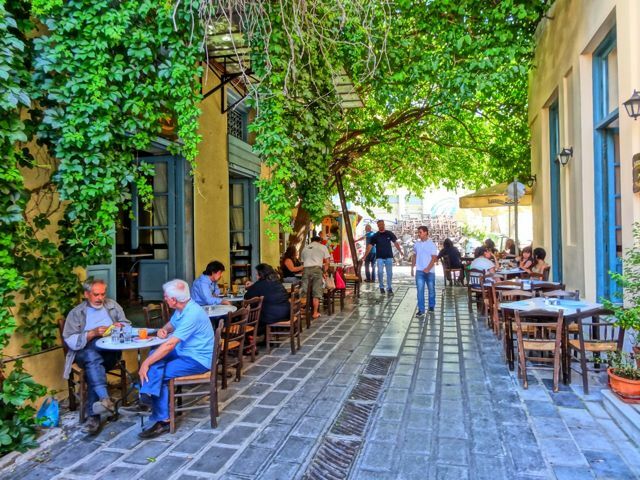 If it is a beautiful sunny day I can go to Monastiraki and sit in a cafe by the Ancient Agora and drink coffee or meet some friends for lunch and ouzo or wine, watching people and enjoying the outdoors, oblivious to the day-to-day struggles of the people in the city around me. If I feel the need to get out of the city altogether I take the metro to Pireaus and in a few minutes I am on a boat on the way to the island of Aegina, or Angistri, or I get in my car and drive out of the city to somewhere in Attika, or the mountains and beaches of Evia, or to the Peloponessos and I can still be back in time to go out for dinner with my friends. Even if the weather is not so great I just leave my apartment and walk to Fokionos Negri, pick up a Herald Tribune, and sit in a cozy cafe with all the other coffee drinkers, or take the trolley downtown and go to a museum, a movie, a favorite lunchtime taverna or wander around the miles of archaeological park that surrounds the Acropolis which is as green as Ireland in the winter. At night there is never a shortage of people who want to go out to a taverna or to a bar and hear jazz, or an ouzeri and listen to a couple guys playing rembetika. I live in Athens like a tourist and it is a paradise. But unless you are either soulless or in complete denial you can't live in a place where people are suffering and not feel bad for them. I don't really need another flashlight with an infrared light, or a flower for my wife or girlfriend, or another 8-in-one screwdriver, but the Pakistani guy selling it needs the euros more than I do so I buy it and accept the lecture from Andrea about throwing around my money. I know Athens is not paradise for him, or for the Africans selling CDs and knock-off handbags, or the guy with no arms or legs begging on Ermou, or the old man selling the lottery tickets that I will buy and never even check to see if I have won. I know that Athens is not a paradise for the people marching for higher wages, or the immigrants protesting because one of their leaders was beaten or worse by the police or by thugs hired by the company she was trying to unionize. 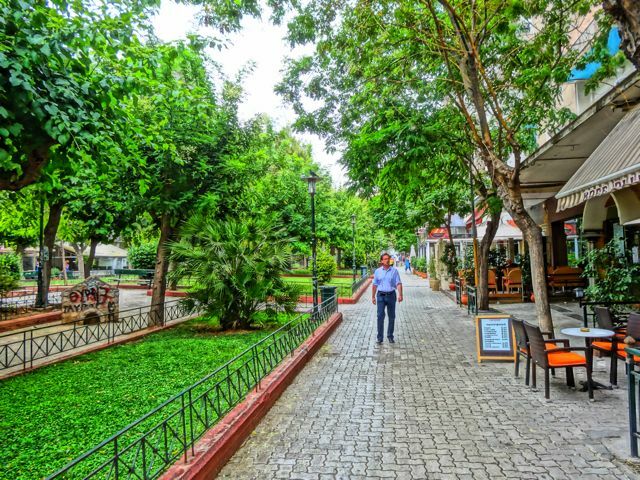 I know that Athens is not a paradise for the people of Kypseli who watched in shock as municipal employees cut down all the trees in their park because the city decided the area needed another parking lot, and then battled the police so they could occupy and replant it. 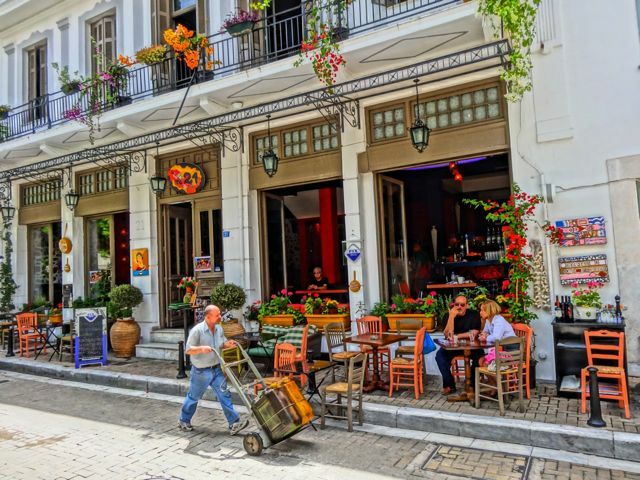 Athens is certainly no paradise for the people who own restaurants and cafes and have watched their business slow to a trickle because of the crumbling economy or the lack of tourists, and wonder what they are going to do with the rest of their lives. Or the people who had downtown businesses that were burned, looted or damaged by rampaging 'anarchists' last December, and struggled to repair and reopen for Christmas only to find that Athenians were now shopping at the malls, and who now wonder if the whole thing was not some kind of conspiracy. Athens is no paradise for the cops, or for the young people who went to University abroad and made the mistake of coming home where they are lucky if they can find a job as a waiter, or in many cases don't work at all but live off their parents or grandparents. There is really only a handful of people for whom Athens is a paradise. Government people and mafiosi who have so much money that they are completely insulated from the problems of the city and spend their days sleeping or making more and their nights at the clubs chasing women or people who owe them come to mind. 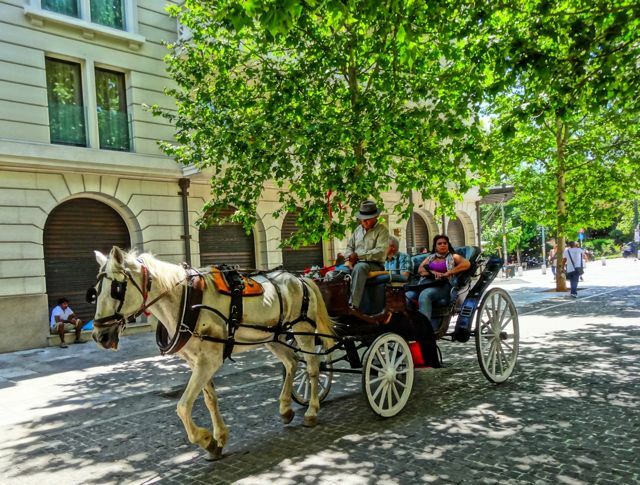 The tourists who fly in and out of Athens and never see the sorry side of the city, and why should they have to? Their money is the lifeblood of this country and they should be treated with the respect of visiting dignitaries. 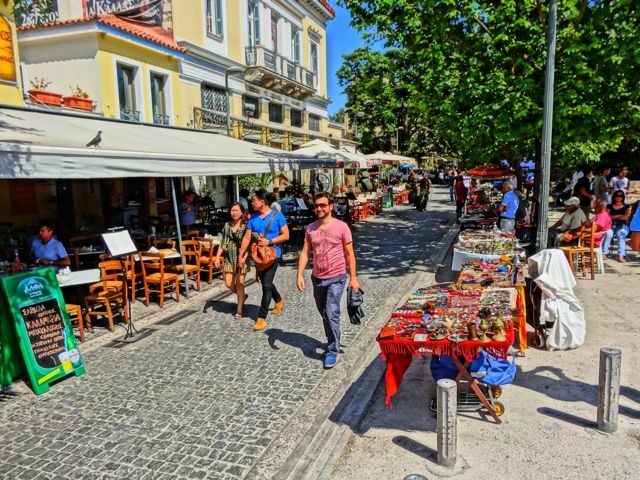 Successful actors, actresses and athletes, writers and people who own businesses outside of Greece that enable them to work and live in Greece have it pretty good too. I guess I am one of them. But somehow, sometimes I don't feel like I am in paradise. I enjoy myself most of the time and I can't say that I am suffering. But I feel like I am losing paradise or maybe the ability to appreciate it. That the Athens I loved as a child just exists in pockets that seem to disappear one after the other and I go from one pocket to the next, or look for new ones or old ones I didn't know about. It really seemed like a few years ago that these pockets were expanding and overlapping each other and that Athens was getting better and better. Now it seems to have stalled, like people have given up because they gave an Olympic party and all the guests had fun but nobody came back to say thank you or hang out after the party was over. 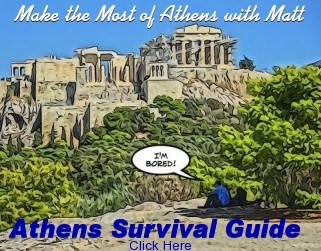 In my website I praised Athens so highly that thousands of people, who had been told to avoid it and go straight to the islands, were convinced to stay here for a few days and were happy they did. 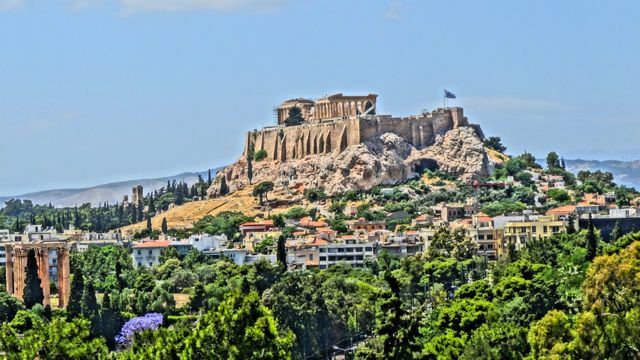 Now I wonder will Athens become a place that tourists avoid entirely or stay on the outskirts, just close enough to visit the Acropolis, have lunch and buy some sandals and then get back to their seaside hotel in time for a swim before dinner by the pool. Its unfair really. Athens is still a safe place despite the images painted by the international media and the Greek media who are only too happy to exploit any incident if it gets their photo on CNN and a few euros in their pockets. When I went back to North Carolina for Christmas my friends acted like I was a returning war hero and I was willing to play that role if only for the sake of making interesting conversation, but in fact I felt more threatened and nervous walking the streets of little old Carrboro at night than I ever did in Athens, even at the height of the December riots. OK there was that one time I was watching the 'anarchists' throwing rocks at the cops and because I did not want to be mistaken for one of them and get tear-gassed I left and just walked briskly(ok maybe I ran a little) and a block later the danger was over and I was surrounded by shoppers and people who did not even know there was a demonstration up the street. I did feel a surge of adrenaline that I might describe as fear, but I had gone looking for trouble like a good reporter, and then decided that trouble was the last thing I wanted. I never feel like something out of the blue is going to happen to me in Athens the way it would in the USA where half the country is armed to the teeth. If I am a victim of a crime it will be non-confrontational. Nobody is going to stick a gun in my face and take my money and then shoot me. Maybe if I am not careful someone will take my wallet or my cell phone on the metro. But with pickpockets you pretty much have to be an accessory to the crime. You have to allow yourself to be pickpocked by being careless. If you get taken to a bar by a nice man on the street and then rolled for 150 euros for the 2 glasses of champagne you didn't realize you were buying for the beautiful girl in the miniskirt then it is your fault for being a sucker, and chances are it won't happen again. Dangers in Greece really are few, so why do I have this feeling of impending doom? I think it is because Greece, well Athens really, is at war with itself. There are too many problems that were not dealt with that are now becoming like the Hydra and you cut off one head and two more take its place when you could have killed it twenty years ago when it didn't even have a head. The two party system is like that in the USA where you don't try to make things better for the country, you just do the things that will keep you in power, or make the other guy in power look bad. Solving problems is often complicated and some people are not going to be happy with the solution. In Greece unhappy people mean a loss of votes and so there are no solutions because no politician has the courage to make tough decisions that may cost them votes even when they know it is the right decision. So they just talk about fixing the problem knowing that just down the road there will be another crisis that will make most people forget about the current one. But when you get down to it there is really only one problem. Its selfishness. Its every man for himself on a ship that does not even need to sink but will because of the inability of people to work for the common good. Sure, like those pockets I mentioned before, there are pockets of people here who do care and there are individuals looking for pockets to be a part of, but for the most part these pockets of resistance are like drops of rain in an ocean of corruption and ignorance. Until everyone works together for the good of all the citizens, immigrants and visitors to Athens I expect things will just get worse. From past history we know that in a crisis the Greeks can work together and perform miracles. Thermopylae, Salamina, The War for Independence, the Italian Invasion and the Olympics showed us this. But now the Greeks are so busy fighting amongst themselves that when the crisis comes it may not be recognized until it is too late. And like the aftermath of WW2 and the Civil War it will be up to the survivors to pick up the pieces and start again. If there are any survivers and any pieces worth picking up. I still relish the time I spend here. But I catch myself thinking about North Carolina while I am in Greece the way I think about Greece when I am in North Carolina, a mixture of nostalgia for the good old days and a need to simplify my life and escape from the chaos around me. But in North Carolina when it is a beautiful cloudless, sunny spring like day, which can happen anytime in either place, it makes me long for Greece. But here in Greece when the sun is shining I can hop on a bus or walk down to Adrianou Street in Monastiraki and sit in a cafe in the sun, drinking coffee or ouzo, eating mezedes and talking with my friends while watching the world walk by, all of us happy to be alive and to be in Greece on a gorgeous sunny day. On days like this the problems of this country seem very far away, even though just a few blocks down the street the members of parliament are making speeches about solving them while actually doing nothing. I read somewhere about "rendering Ceasar what is Ceasar's". Maybe Jesus said it. What it means to me is let those who thirst for power and money wallow in the mire that they create. Stick to your higher purpose of love, forgiveness and peace and good things will happen. For a tourist or someone like me who is really just a spectator here, this is not that difficult to do. And on a sunny Greek day in February that feels like May, even the Athenians, who have watched the promise of their city evaporate with the billions of euros that were stolen and wasted by crooked politicians, greedy contractors, mafiosi tax collectors and brainless bureaucrats, are happy to be here.